Bulb horn gives it an antique look but this 1924 Royal Enfield 350 was advanced for its day. There's 1924 road test of the then-new Royal Enfield 350cc motorcycle on Jorge Pullin's "My Royal Enfields" blog. It's a look at not only a fascinating motorcycle, but at an age when motorcycle test riders had different concerns. In those days it wasn't so much a matter of "what'll she do?" (top speed), but "will it climb a hill?" And testing was serious business. Those testers rode the Royal Enfield 500 miles, 40 of them after a heavy snowfall, with roads "mantled in white." They praised the handling: "Snow covered roads, of course, gave us an excellent opportunity of testing this, for beaten snow is treacherous in the extreme." No kidding! The road test appeared in the Jan. 16, 1924 edition of Motorcycling magazine. The testers indicated that the 349cc machine represented a change in Royal Enfield's model line-up. The firm's claim to fame around the time of the First World War had been its big twin-cylinder sidecar outfits. "Our readers may be pardoned for associating the Enfield name chiefly with sidecar machines, although, of course, the small two-stroke models have been popular for some years for runabout work." "The tendency of the times" now favored 350cc solo motorcycles and Enfield's entry was ready for 1924. It was a single-cylinder, four-stroke motorcycle "with a bore and stroke of 70mm and 90mm respectively." If that sounds familiar it's because, although a century has passed, the exact same dimensions exist inside today's Royal Enfield's Classic 350, with its Unit Constructed Engine. This was a side-valve motor, but it had a mechanical oil pump, an advanced feature for 1924, when riders were expected to hand pump oil to the motor based on guesswork about how much it needed. The testers considered the mechanical pump perfectly reliable, but — perhaps as a concession to conservative customers — the Enfield still came with a hand operated oil pump on the tank, in case extra lubrication was needed. It had a two-speed gearbox operated by a foot pedal. This allowed low gear to be momentarily engaged for starting off or, with an extra motion of the foot, locked into place for extended use. My reading of this is that the Enfield was meant in practice to run only in top gear ("even in London traffic" the testers wrote). With only one gear to ride with, testers admitted, the Enfield wasn't going to manage to climb any "freak hills," but it was capable of climbing "any ordinary hill" in high gear. Testers estimated a top speed of 50 mph. They gently criticized the brakes, which must have been awful: only a front stirrup brake on the front and a rear belt rim brake. 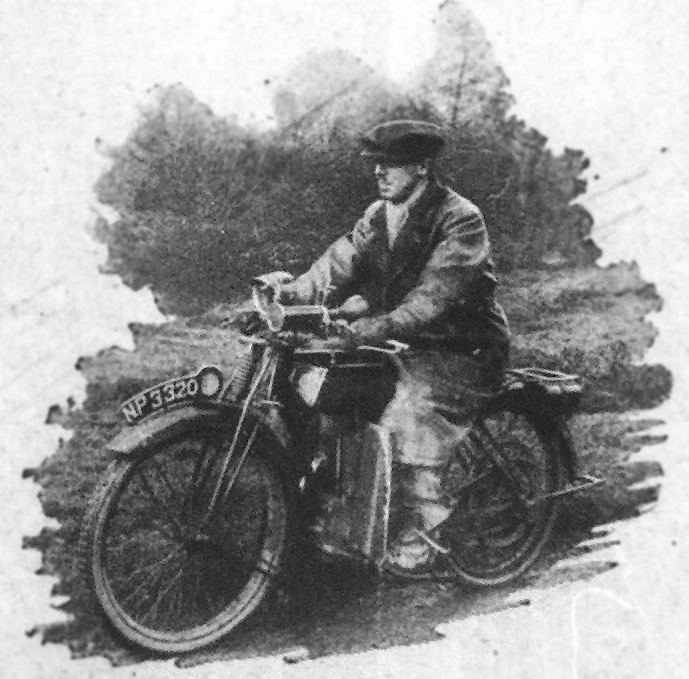 "This new Enfield is undoubtedly a very pleasing machine to ride, and its really excellent steering properties, combined with the comfortable riding position, makes it very suitable for use under adverse conditions."